If you think being described everywhere as “Serena Williams‘ husband,” would have Alexis Ohanian feeling salty, well, you’re wrong. The Reddit co-founder was asked if he was ever provoked by the description, and he made it clear that, actually, he isn’t. Far more people have cheered for his wife than those who know him, he shared, and his contribution to the world is nowhere near what his wife has done. I don’t mind at all. Only a few hundred million people use @reddit every month and only a small percentage of them know who I am. (Far, far more people have cheered for my wife; specifically, for the last two decades) Just math. And even if @Initialized ended up being one of the greatest VC funds of all time (that’s the goal), the contribution to the world — let alone recognition — isn’t close to comparable to what my wife has done and will continue to do. It’s pretty liberating, really. I’m used to being the face of my companies, so I enjoy not being the “public-facing” partner in my marriage. Only a few hundred million people use @reddit every month and only a small percentage of them know who I am. And even if @Initialized ended up being one of the greatest VC funds of all time (that’s the goal), the contribution to the world — let alone recognition — isn’t close to comparable to what my wife has done and will continue to do. All of it is too sweet. 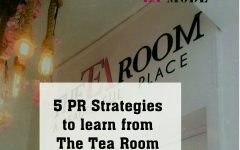 5 PR Strategies to learn from The Tea Room. Meet Derin Fagbure Speaker Lamodepreneur Conference! !